Last month I wrote about setting up rules to deal with the mass of incoming messages to your e-mail inbox. This month I will describe a method of organizing the box into folders to deal with messages efficiently. 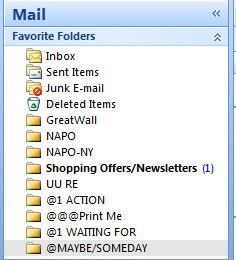 It will work best if you set up the rules first (see last month: Beating Back the Inbox, Part 1), then the folders. 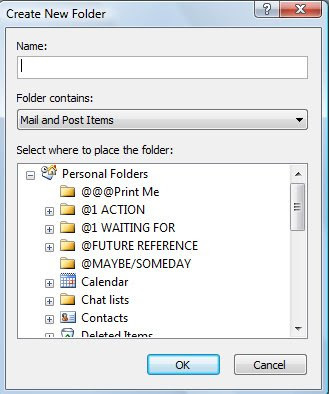 Here is how to set up a folder in Microsoft Outlook. It is best to put major categories in the Personal Folders sections, and then you can create subfolders if you want within those categories. You can add any of these folders to you “favorite folders” box, by right clicking and then clicking “add to favorite folder”. It will now show in your Favorites box. @1 Action: This is where I put anything I need to act on. I only put things here that I cannot complete in two minutes or less (these I try to do when I am reading my e-mail), and I force myself to ALWAYS make a note in my planner that the item needs attention. In addition, I usually check this frequently (every couple of days) so I don’t forget about anything. @@@Print Me: This is where I put items that I need to print in the future (this is useful if you have a remote printer). I go through this folder about once a week. @1 WAITING FOR: This is a folder for items that I have replied to or requests I have sent out that I am waiting for a response on. If I get messages related to an internet order or other project, I put them in here. If I have asked someone for something I BCC myself (just put your e-mail in the BCC box and it will send a copy to you without showing up on the other person’s message) and then I put my copy in my WAITING FOR file. This is a great way to remind myself what I have asked others for (and when I asked). Subfolders could be created for multiple people. I go through this folder about once a week. @Maybe/Someday: This is where I keep things that I might do someday, or really don’t have time to decide about right now. Once in a while I go through this file and delete what I no longer need. This is a great way to put things “out of sight” but not lose them, and definitely not print them, unless I need to. I have another folder (not shown in my favorites), called “FOR FUTURE REFERENCE”. This folder is where I keep information that I want to have long term, but don’t use often. I created subfolders for Work and Home; and inside those, further broken down by broader topics. These can get overloaded just like regular hard files in a cabinet, and would benefit from occasional purges. I hope these ideas are helpful to you in organizing your Inbox. For personal attention with this or any other task, simply call Linda. This article may be reprinted or reposted on a non-exclusive basis provided Linda Groat's name and contact information is included.